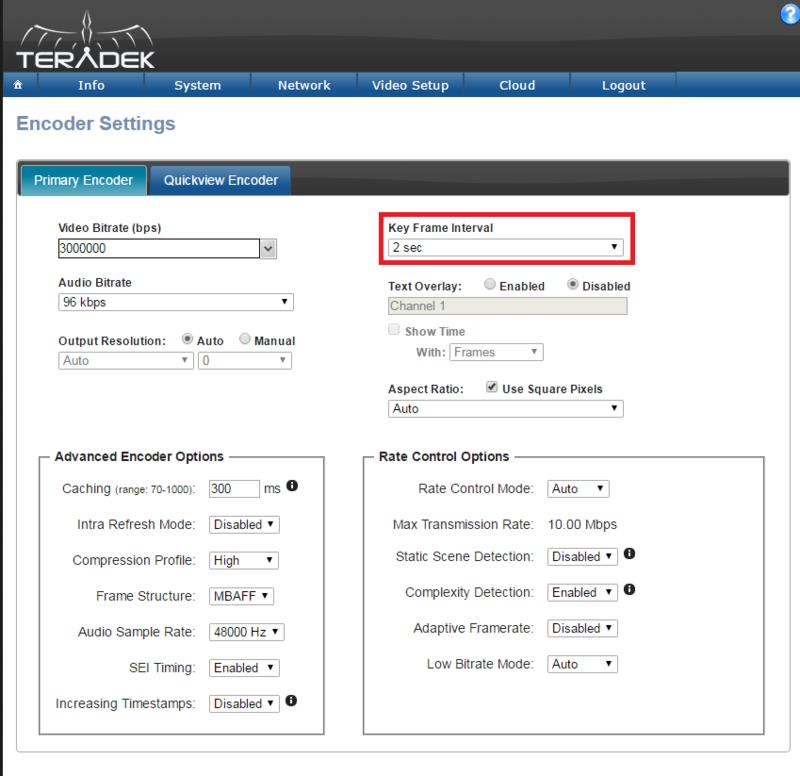 The DaCast service is compatible with almost any RTMP-enabled encoder, including the Teradek Cube. This document will help you to get you up and running with your Teradek Cube. *Note that Teradek Cube can only stream to a single destination at a time. This tutorial assumes that you have already connected the device to a camera correctly and are now ready to start configuring the streaming aspect. First, place the USB drive that came with your Cube into a computer while the device is nearby. This will allow you to install TERAcentral to manage and configure the encoder. Now start the program. If your Cube is set up correctly, you should already see a quick still image picked up from your camera on TERAcentral. Now click the icon to begin. You will now want to configure your internet source so you can broadcast through DaCast. To do this, click NETWORK and then CONFIGURATION from the navigation bar. From here, there are several selections, including Wired, Wireless and USB Modem. Your experience will differ based on your connection type. In any case, make sure that you select . Once the internet source is done, click VIDEO SETUP and then STREAM SETTINGS within the navigation bar to configure for DaCast. 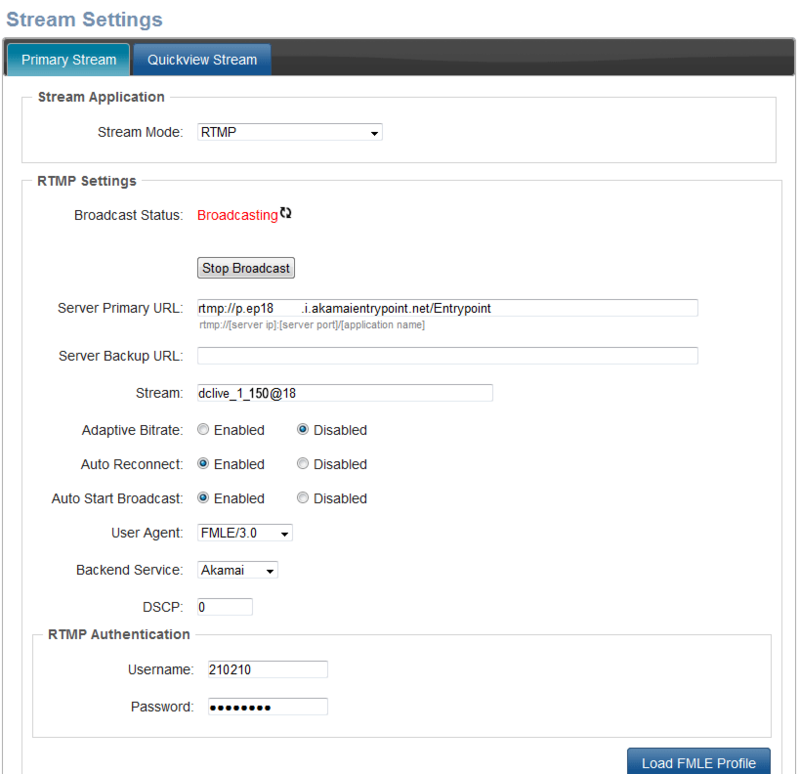 On this page, select “Stream Mode” as “RTMP”. If “RTMP” does not appear as a select-able option, please email support@teradek.com for a free license key. You also need to change the “agent” field to FMLE. Now, you need to fill out your “Server URL” and “Stream” information, which is related to your DaCast account. To get this information, when signed into DaCast, go to ENCODER SETUP and select your source as “Other RTMP encoder”. This will give you a “Stream URL” and “Stream name”. Back on the page to setup the Cube, place the “Stream URL” in the “Server URL” field and the “Stream Name” in the “Stream” field. In addition, you will also need a login and password. This will be a series of numbers (six each) found under ENCODER SETUP where you got the Stream URL and Stream name. Note that this is NOT the email address that you use to log in to your DaCast account. Enter this other login information and click Apply. You are now ready to begin streaming to DaCast. For Teradek Cube and other products, the default key frame value is 2 seconds. If you have adjusted that value, you need to change it back by logging in to the Web User Interface of the Cube over Ethernet or Wi-Fi. Go to Video Setup > Encoder Settings and change the Key Frame Interval to 2 seconds. If you do not set this value at 2 seconds, the image might appear broken on the stream. Alternatively, considerable buffering might occur. if you want to stream in 16:9, please set the cube for 720i or 1080i. This will enter the correct aspect. You can change this quality setting later. Please note that the Teradek Cube DOES NOT support streaming to %i for multi-bitrates. For multi-bitrate streaming, he stream field should read: dclive_1_150@XXXXXXX (with the Xs being unique to your account).